Are you looking for a good way to keep your iPhone XS Max charged in the car? Are you tired of having your gas station chargers blow out on your all the time? Then you need to make sure that you’re getting a quality car charger built to last, and you certainly won’t find these at the gas station or really any store. So if you’re ready to throw your car charging problems to the wayside, be sure to follow along with us below. We’ll show you the best car chargers for the iPhone XS Max. Here are our favorites. 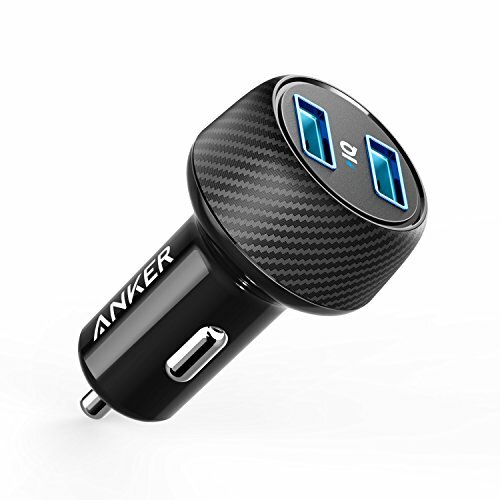 Anker is up first on our countdown, and has a powerful car charger that can juice your iPhone XS Max up in no time. This one is actually able to pump out a whole 24-watts, juicing up the iPhone XS Max and anything else in a jiffy. It’s got two USB ports on it, actually allowing you to charge up two phones simultaneously. Built-in PowerIQ and VoltageBoost technology means that your phone is going to charge at around fast charging-like speeds. It isn’t necessarily Qualcomm’s Quick Charge, but is still fast. Anker has, of course, included some built-in safety features make sure that your phone won’t be damaged in the event of overcharging, overvoltage, or extreme temp increases. However, there’s a warranty that comes with it to keep you protected against any defects that might happen. That said, this one differentiates itself with a low profile and slim design. In addition, AUKEY throws in a bunch of extra protections for overcharging, overvoltage and extreme temperature increases. Don’t let those things hinder you though — AUKEY is confident enough in this product to offer you a 45-day money-back guarantee, no questions asked. In addition to that, they keep you safe from defects by giving you a 24-month product replacement warranty. It’s worth checking out! Next is this wonderful car charger by Jelly Comb. If you’re looking for the creme of the crop in car chargers, the Jelly Comb is it. 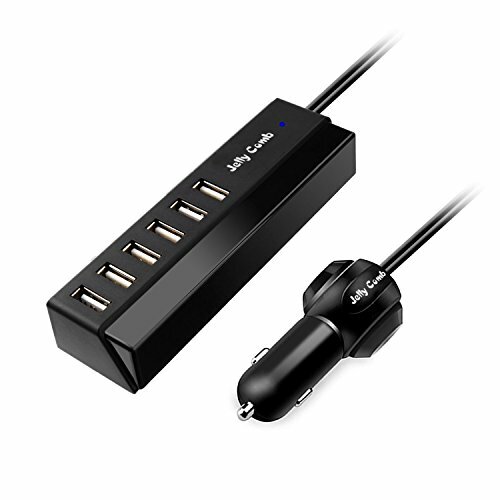 This one actually has a whopping six USB ports — so yes, you can charge six devices simultaneously. You can actually get a whole 65 watts of power output out of this charger. Jelly Comb works to give you the maximum charge output possible, so it uses artificial intelligence to detect the maximum charge your device is capable of taking. With that information, the Jelly Comb automatically adjusts its charging rate to give your specific phone the quickest charging rate, up to 2.4 amps per USB port that is. 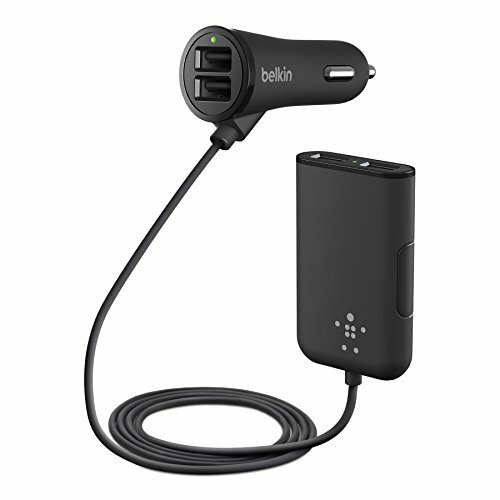 If you frequently go on road trips or need to charge multiple devices simultaneously, the Belkin Road Rockstar is your most ideal car charger. It actually has four total charging ports. There are two in the front for the front two passengers to charge their phone, and then there’s an attachment with a six foot cable that reaches into the backseat so people in the back can keep their devices juiced up as well. The Belkin Road Rockstar actually has a total 7.2 amp out, which means you’ll be able to juice up your devices rather quickly. But, keep in mind that the more devices that are connected, the slower your charge is going to be. If you don’t like the multiple USB ports packed into the car chargers above, then you might want to consider the AUKEY Car Charger. 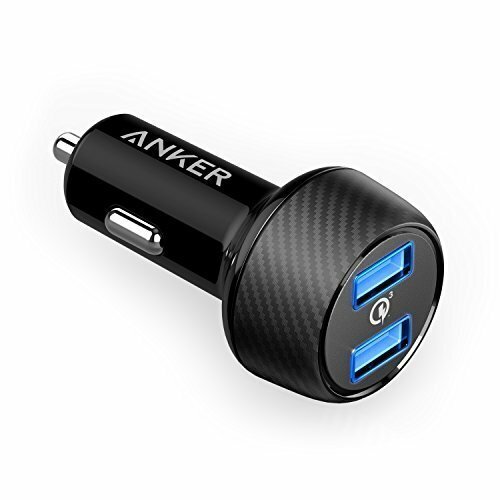 This is a standard car charger with only two USB ports. It’ll give your smartphone a relatively quick charge, as it’s only slightly slower than the Belkin Road Rockstar with a 2.4 amp output. 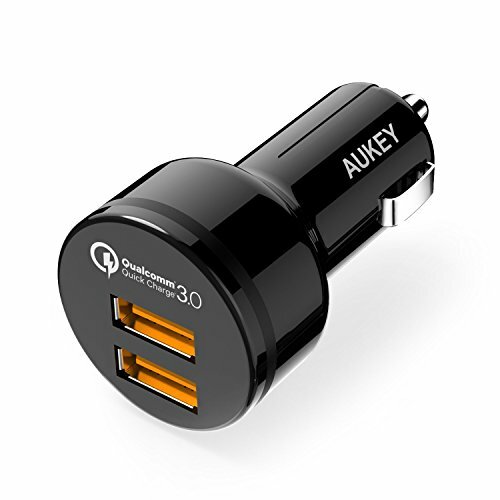 You can expect to get some great reliability out of the AUKEY Car Charger as well — this car charger is made with premium circuitry and safeguards against electrical issues. That said, you shouldn’t have a problem with too much current, over charging or over heating. AUKEY stands by their product as well, giving you hassle-free replacements against any defects. 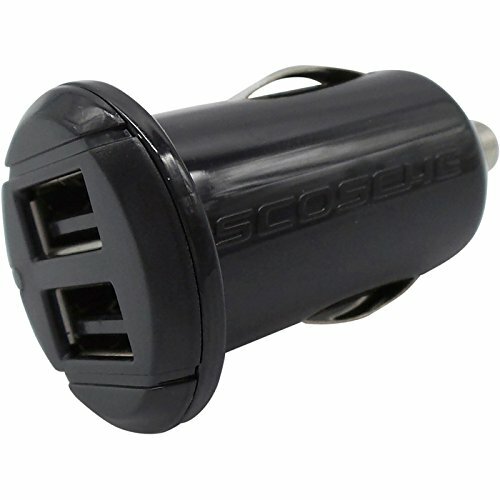 The Scosche Revolt is another excellent car charger. It’s similar to the AUKEY Car Charger, but it is one of the slower ones on our list. 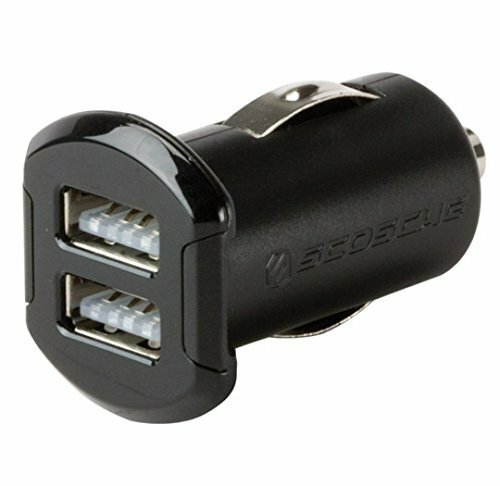 It’s only capable of outputting 12 watts of power, and with only two USB ports in the Scosche Revolt, that’s 2.4 amps per USB port. The Revolt will give you a decently quick and persistent charge, but it’s certainly no fast charge. 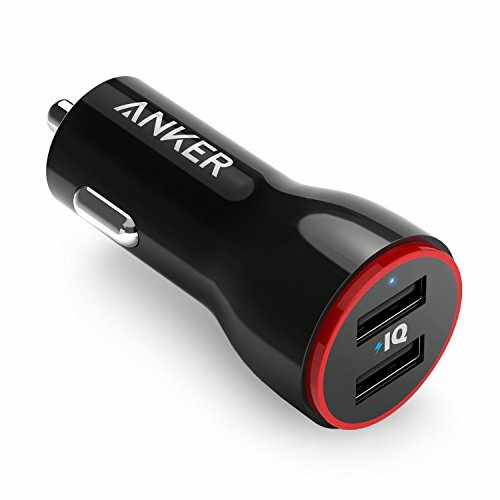 Last up on our list is the Anker Quick Charge Car Charger, but it’s still one of the best car chargers that you can pick up today. This one actually supports Qualcomm Quick Charge 3.0 technology, which means it can charge up devices that have the corresponding Qualcomm chipset at an extremely fast rate. It can charges devices that don’t have that chipset pretty fast as well, as this one is able to output a whole 39 watts of power. Charging your iPhone XS Max from dead to full in the car shouldn’t be a problem for this car charger then. Anker also includes a warranty against charging defects, so you don’t have to worry about losing your phone to faulty circuitry. So which one of these car chargers is the best? Really, you can just pick your preference off of this list, and you’ll be getting something really good. These all essentially do the same thing, but really it comes down to how many USB ports you need. If you need multiple, the Jelly Comb or Belkin Road Rockstar are easily the best options for you, but if you only need to charge one or two devices at a time, any of the other options will work just fine.